My 9 year old daughter brought this book home for me to read. She told the school Librarian that she was checking it out for me, and the Librarian let her check it out as her 3rd book (they are only allowed 2 books) since it was for me.I loved this book! It was so well written. I loved the characters, even Aunty Gwyneth, who was soooo creepy. I loved the clay dragons, and wish that I could have a few of my own!! Who wouldn't want a wishing dragon, a listening dragon (you could really spy on people ;) ), or a writing dragon? I also love the way that the dragons talk, and could picture the sounds that they were making!My favorite character would have to be Zanna. She reminds me so much of Abby on NCIS! She is so quirky and lovable, and really tries to keep David in line.I don't know why it has taken me so long to find these books, and it looks like this one is #2 in the series. Now I have to find the other ones and read them!! Rating: 2.5/10...This is just plain bad. It fixes everything that was wrong with the first book, and then proceeds to boil it in a spiritual, cosmic tale that is much too confusing and poorly executed to be put in a children's book. Let me put it this way: I read novels about time-travel, alternate realities, and spiritual matters, and NONE of them are anywhere near as confusing as this book. It is simply an underdeveloped plot, and it doesn't help that the writing is fairly poor as well.Also, there's too much suggestive content for the audience. Immature jokes about shaking "talismans" and plenty of lust on the part of the main character, who, once again, does not seem to behave his age.If you didn't like the first book, don't read this one. I probably won't be continuing the series at my library. This book is an okay book. That is my hook. This book is not a very good one, because it is very boring, and can lead to spontaneous sleeping spells. Chris D'Lacy wrote this series of dragon books, without the dragons. There are dragons, just not as a person would think a dragon is. This book is about a man named David living in a house with his landlord and her daughter. The landlord creates clay dragons that David soon realizes come to life, and have a purpose. David goes to find the origin of the dragons, and must travel to the arctic in order to find the last dragon on earth, which is ironic, since fire does not usually thrive in extrememly cold weather.I recommend this book to readers who do not like a lot of action or suspense in their books, but like calm books about relationships and dragon fantasies. In reality, this book does not do dragons, who are supposed to be ferocious, giant creatures justice, since they are as small as clay dolls. Actual Rating: 3.5 StarsIcefire was definitely a step up from The Fire Within. Going from squirrels to polar bears was a smart move on d'Lacey's part.Zanna started out being my least, least favorite character. I could not freaking stand her. But then she lost what made her aggravating and she became worlds better and I now support her relationship with David. Lucy has a Luna-on-caffeine angle to her, which I just now realized. While she's not my favorite character, I still think she improved in this book.What didn't work about this book was the fact most of the characters were on the brink of breaking free and becoming the most awesome characters ever. But David hogged it all, no joking. I think had we seen a bit more of Liz, Luce, and Dr. Bergstrom, it would have been worlds better. It would have earned a full out five, instead of a 3.5.I'll probably end up reading the others we have, because they have a nice new angle on dragons, giving them special jobs to do and making them small parrot-like friends that help out people. And I'm a sucker for fantasy meets the real world. This book is really entertaining with many twists to it. I could relate this text to the real world, because of how the story is set in the perspective of a tenant with a really interesting landlady and her dragons. This is similar to the real world because different families have different beliefs and can have many really interesting stories. Honestly, this book was very disappointing. I expected so much more. When I was younger and reading this series, it was so much better. Maybe it's because I've grown older. But I honestly hated this book. I don't see me reading the rest of the series in the future. The romance did not make sense and the plot was just too boring. As people say it was cringeworthy. I'm so sad that these books don't excites me anymore. Icefire, by Chris d'Lacey, is a 426 page long children's fantasy novel. The book is about a boy named David. He is renting a room from Elizabeth Pennykettle, her daughter Lucy, and their mysterious clay dragons. In the epic second installment of the Last Dragon Chronicles, David must find the link between the dragons and the Arctic, and the secret of the icefire. I personally loved Icefire. It was an extremely captivating book. The author’s fast paced writing style kept me turning the pages. For example, here is a passage from the book: “The boards beneath the tenant had quickly given away, sending him crashing to the soil below- a fall of a couple of feet, no more, but the rubble that had followed him through the hole, sucked by a vortex of Gwilanna’s hate, had piled in on top, encasing his body and squeezing the air fully out of his lungs. One pitiful hand had poked through the mound, twitched just once, then fallen flat.”	The plot twists and turns and keeps you on the edge of your seat. The way you view a certain character can change in a moment. While on the topic of characters, Chris d'Lacey’s characters are also well described. This is a quote from Icefire describing a character: “Suzanna- Zanna- Martindale was a girl in his department. She was a Goth. She had a face as white as a hard- boiled egg and she dressed from head to toe in black; black tiered skirts full of tassels and fringes that danced across the laces of her black boots; black T-shirts, usually sporting some mystic picture…” The author goes on describing the girl for about a page. Don’t get me wrong; this isn’t too much detail. Instead, Chris d'Lacey writes just enough to create a vivid mental picture in your head but keep you interested in the story and not sinking in a sea of detail. Another plus about this book is that it’s plot is original. When I picked up this book, I expected a generic plot about a hero boy riding a dragon to defeat an evil witch or sorcerer. What I got though, was something I had never seen before. I had never heard of, or seen, the concept of clay dragons. I think the originality of the plot is one of the main reasons I kept reading. Chris d'Lacey is a well qualified children’s author. he has won many medals for his books. This is a list of his awards: In 1998, Fly, Cherokee, Fly was shortlisted for the Carnegie Medal, in 2002, The Fire Within won the Rotherham Children's Book Award, also in 2002, Chris d'Lacey won an Honorary Doctorate from the University of Leicester, in 2005, Horace was shortlisted for the Bolton Children's Book Award and the Hampshire Book Award, in 2006, Icefire was shortlisted for the Angus Book Award, and in 2010, Gruffen won the Books Factor Award. Icefire( The Last Dragon Chronicles, # 2) is worth $6.53 (paperback) on Amazon.com. 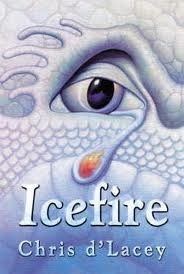 Icefire was published on July 1st 2007 by Scholastic Paperbacks (first published November 25th 1985). Third choice book second quarter:Icefire is a great book, Icefire has a lot of action and even more then the first book. In Icefire there is a little drama, a lot of danger, and some adventure. The reason why I said there is danger is because of aunty Gwyneth or really Gwilanna the dragon that wanted the fire tear that Guinevere had caught when Gawian had dropped the last of his spark. Near the end of the book when Liz was about to wake up from her deep sleep a lot happened one David had met all of the polar bears, two Gwilanna had gotten rid of the dragons in every corner of the house including the ones in the dragons den, three Bonnington had drank some of the snowball after it melted and the rest of the special snowball that Liz had gotten when she was little from a polar bear named Lorel. The very last page was an absolute shocker, a dragon named Gretel which was Gwilanna's dragon before she left had taken the lock of liz's red hair and was trying to bring back the dead dragon named Grockel. I don't want to spoil the book, I hope you like the book. The sequal to the first book, "The Fire Within", "Ice Fire" can only be described as a great improvement. I liked all the same things but i think what is best in this book was the suspence, the new characters and the conflicts. Those are the things i didnt realy find in the first book.The first thing i like is the suspence in the story. The first story was realy setup for the next ones and in the firt book the suspence and climax doesnt come until the end and Ice Fire keeps the suspence going. The story stays suspeceful untill the very end and also gives a hint of what is to come in the next book. I also liked the new characters that came in Ice Fire.The new characters bring their own new stories and also reaveal a little bit more about the older and main characters pasts. The new characters also add more mystery in the story wich only makes it more interesting.Finally the last think i like was the conflicts. The new characters bring new characters in whole new situations and that makes everything better. The conflicts in the story make the resolutions and climaxes in the story more exciting and interesting. The Fire Within and Ice Fire are just the begining and are not the best in the series but they set up the base for the rest of the series. The book is definately one of the best ive ever read and i would recomend it to any other fictional book reader. So dont just stop at the fire within, keep reading and get to the other books in the series because it only gets better. Icefire, by Chris d'Lacey, is about David trying to find the fire tear of Gawain, the dragon. The story begins with David talking to Dr. Bergstrom who is the polar bear, Loral. David, with the tooth of Rengar, tries to find Gawain's tear before Gwilliana, the Sybel, steals it to make a new, real dragon. With the help of Greth, the wishing dragon, Grace, the listening dragon, Grettel, the potions dragon, and Gadzooks, the writing dragon, David sets out to the arctic to the Island of the Tooth of Rengar. David does not find the fire tear yet, but encounters nine polar bears that rule the arctic.I really liked this book because it was exciting and I really thought David was going to find the fire tear, but he doesn't. It was suspenseful and really awesome! In all honesty, these are books that are fun at the time of reading them but as you get older they quickly lose their allure.I’ve always enjoyed dragons books and because of that I think it took me longer to realise it is a rather repetitive read. Not that such a thing really matters all that much with children’s books, so long as the child is engaged with the story, but as I worked my way through the series they seemed to lose their fun somewhat because of this.By the time I reached the fourth book I was old enough and wise enough to realise I wanted something more from my reading. Nevertheless, it was fun at the time. In this sequel to The Fire Within, David must uncover the secret of the clay dragons to save Liz and Lucy from the evil clutches of the sibyl Gwilanna. He must discover the link between the Arctic polar bears and the fire of the last dragon Gawain. He must also deal with two girlfriends, a strange visiting college professor, a white hedgehog, a pushy publisher, and Mr. Bacon next door. An enticing sequel, sure to make you want to read more of this series. It's a very fun read even with the global warming, save the polar bears political correctness. A little more intense than the first book. I thought the characters in this book were more interesting than "The Fire Within". The aunt is not who I thought she would be! I really liked hearing about Professor Bergstrom and Zanna, who turned to be... David's girlfriend! She cleaned her act up after acting like a Goth. I liked the book because their was dragons in the book and they were made out clay. It also had facts about medieval times. It also talked about ancient polar bears. While I enjoyed the first book things began to take a turn in this one. Just not as intriguing I guess. I stopped reading the series on this book! Bummer. . . . Likes: While The Fire Within was a great introductory book, Icefire is the perfect beginning to the meat of the series. Lucy makes her first dragon – a wishing dragon. David names him and so the dragon becomes his, and after making a bizarre wish, things get a little crazy. This novel is a quick moving story that never quits with the intensity of the story and interesting plot devices never waver. I like that we get a closer look at the dragons and their personalities. We also get introduced to a few new characters – Zanna and Aunty Gweneth – that are both quirky and scary respectively. The element that I loved the most about this novel though is the fact that it has so much to do with the Earth and how all things are connected.Dislikes: While I understood the path this novel was taking, I can see where it would be confusing to some readers. David suddenly can communicate with dragons, a new love interest is thrust on to the scene, and there is visions/time travel/alternate dimensions that can muddle readers minds.I may a little biased again in the rating of this novel, but I have to give it 5 snowflakes. over 432 pages; I read only 108 pages. and cannot add this to my elementary collection. It has a storyline with a college student named David Rain who is involved with a girlfriend he is considering moving in with. Later a girl from his college department aggressively pursues him - grabs him by the neck and kisses him. This is just not appropriate subject matter and age appropriate characters for elementary kids. The first book in the series was weird but ok. This one is NOT! Definitely NOT recommended for ES. Why do the publishers say ages 8-12? It is not EVEN in that ballpark! Seriously! You read the first book of this series (The Fire Within) and you're like, "Aww, that's so cute! TheyMre protecting wildlife and dragons are real!" And then you mov in to the next book, wondering what'll really happen and then BAM you are hit with icy legends, romance, possible death, AND JUST EVERYTHGIN SO INTENSE OMG!! !Also, as a cautionary note and (sorry) a huge spoiler, the series goes into the Inuit legends and sort of creates a religious myth of its own. Made me very slightly uncomfortable, but that may just be me. And anyway, the whole series is still AWESOME! This book is a sub-par book. I usually read books before I go to sleep or nap, but I avoid it to stop myself from sleeping and never waking up. Sure, this book influences dreams, but they aren't the way you believe them to be. This story is very confusing. It takes a lot of willpower and brain power to read this book. How is this a children's book? Overall, it needs a lot of work. Much better than the first! Thank goodness! And the story was actually about dragons! And some polar bears, a hedgehog, and a cat... but that was okay, because as I said before, there were dragons! Itty-bitty dragons, but still, dragons! I am still a bit confused on the polar bear/dragon/ice tear/tooth of Ragnar/ sibyl background story but hopefully that'll become clearer in book 3. It had been a while since I finished the first book so it took me a while to get into this. With how this picks up, I needed to read this closer to finishing the first book. I still got into the story and very much enjoyed though. Can't wait for the next one!! I know this series is meant for children - the first book was positively innocent and definitely childish...Nonetheless, moving on to 'Icefire', the story significantly heats up, or cools should I say.A light read, but very enjoyable!I look forward to picking up the next in the series. Chris d'Lacey - He was born in Valetta, Malta, but as a child moved first to Leicester and then to Bolton. After gaining a degree in biology from the University of York, he returned to Leicester and got a job at the University of Leicester in their Pre-Clinical Sciences department.Originally his writing was confined to songs and he didn't turn to fiction until he was 32. His first piece of work was a 250,000 word story about polar bears for his wife, Jay, to accompany a stuffed polar bear he had bought her as a Christmas present.He didn't write another story for seven years, until he heard about a competition to write a story for young children with a prize of £2,000. The resulting book, A Hole at the Pole, also about polar bears, didn't win - but he sent it off to a publisher, who accepted it.His first children's novel, Fly, Cherokee, Fly, was published in 1998 and subsequently shortlisted for the Carnegie Medal. It was inspired by the time he found an injured pigeon in Victoria Park and nursed it back to health at home. It became a family pet and lived for 14 years in a birdbox attached to the back of the house. All of its offspring were given the names of different Native American tribes, which is where the title of the book comes from. )He has since written over twenty children's books, including Pawnee Warrior (a sequel to Fly, Cherokee, Fly), a collaborative novel with fellow children's author Linda Newbery (From E To You), and the best-selling, award-winning The Last Dragon Chronicles. His books often contain environmental themes, and events based on things that have happened to him.In July 2002 he was awarded an honorary doctorate from the University of Leicester for his contributions to children's literature. Although writing is now his main source of income, he still works at the university as the operator of the confocal microscope.His favourite children's books are the Paddington Bear series and The Hobbit, and his favourite children's authors are Allan Ahlberg and Roald Dahl. Chris D'Lacey has written many books like Ice Fire and Fire Star, but his most famous book was Dark Fire, the fifth book in The Last Dragon Chronicles.